Tripping and Stumbling while following Jesus: Saturday mornings with Dad. Tonight I read something on FaceBook from a former student about cartoons that he had posted. He was complaining that they simply do not make any good ones anymore for Saturday mornings. It's true that the art of a decent cartoon has gone out the window, unless they are cartoons of a more adult-friendly nature like Family Guy, or the Simpsons. All that is really made for kids anymore seem to be products to be bought in stores, with a cartoon to follow that will then sell that product. I mean, look at Pokemon as an example. So anyway, what does any of that have to do with following Jesus? Not much at first glance, but allow me to take a few steps into my back pages. At Living Waters this morning, and friend & I got into a discussion about how all truth comes from God...and I do mean ALL truth. (Even if the person speaking it doesn't acknowledge God.) In fact, I am convinced that all truth, beauty, creativity, loveliness, etc. comes from God. That's one of the reasons I am constantly amazed at some of the Outsiders I know who have rejected Christ, and yet they can be amazingly gifted and creative. I want to tell them, "How can you not see that God is blessing you right now with the beauty you are creating. That ability comes from GOD!" I wrote about some of this before if you want more of my thoughts on God & human creativity. When I was a little kid growing up in Sacramento I had an ideal childhood. I mean it! For most of my days during those years, all I can remember are wonderful times. Now that I am older and have seen some other people's childhoods, I realize how truly fortunate I was. and they are some of the best memories I have! Of all the shows that were on during those years, one stood out as my favorite hands-down. I can't believe I actually found the original opening credits for it. Please take a watch. While viewing it, please try to imagine ME, as roughly from 4 years of age to around 10 or 11, prancing around the family room...in my awesomely cute jammies...re-enacting the same movements as Bugs & Daffy, and singing my heart out. What was so great about these cartoons was that they were created for a multi-aged audience. You needed to have something to please every person in an audience because the original venues for these cartoons were movie theaters. Before the advent of television, the movies were where people went to see not just Humphrey Bogart & James Cagney, but also news reals of current events. Also tossed into the mix were long running short films set up as serials, and or course cartoons. Well, Bugs and his pals had it all. Watching these cartoons on Saturday morning actually taught me a great deal about American popular culture from the 30s, 40s & 50s. With spoofs of Frank Sinatra, Bob Hope and the like, Warner Bros. were masters. Oddly enough, one of the most important things that these cartoons did for me was to teach me to appreciate Classical music and Opera. (Seriously, they really did.) When you think about what goes into the music of most kiddie shows these days, it's either one guy with his computer, or some of that "Barney" stuff that makes you want to stab your ears with pliers. Of these spoofs on classical music & opera, I now wish to present to you what is in my opinion, the greatest cartoon ever made...and yes, this is the specific cartoon that all these years later, is responsible for me enjoying a good opera aria. Well, since that particular cartoon taught me to appreciate Rossini, let's see what this next one can do for the appreciation of Wagner. Do feel free to sing along, because almost everyone knows the words. OK, one more. Seriously, pay attention to not only the various colors & styles of the cartooning, but also to the quality of music. Realize that Mel Blanc, the voice of Bugs Bunny and the majority of the characters, is doing an amazing job bringing life to an animated rabbit. I don't know exactly what song Bugs is singing at the beginning of this one, but listen to the hysterical energy that Mel puts into that song. You can't tell me that this stuff isn't brilliant. So, Saturday mornings with Dad. I would watch the cartoons. He would watch me. I was probably a bit more entertaining than the cartoons in some unusual ways I would guess. (I'm sure that my amazing dance steps were something to behold.) I know these things certainly had a major part in forming my sense of humor. 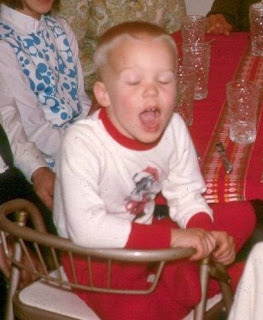 I certainly started practicing my impressions & impersonations around this time. Dad encouraged all of it. I had a great father, and still do. He's an amazing guy...but not as good a fisherman as I am. Finding these clips brought back a flood of memories. I sure had it good back then. I wish that most kids could have had a childhood as good as mine. Lots of love. Lots of caring. Lots of laughs. Lots of hugs. And a childhood imagination allowed and encouraged to run wild. Those were some mighty good times. They were true, noble, right, pure, lovely, admirable, excellent & praiseworthy...and I still think about such things. Thanks Dad. Save a spot of the couch for me. P.S. OK, one more. Unfortunately, the video won't let me embed it here. However, just click on the link and watch it. This has to be the greatest Square Dance routine EVER! "And thanks just all to pieces." Cleansing the Temple Part 2...with Recipes. Can Humor and Christianity Co-Exist?